Panasonic has introduced five new compact cameras to sit in its Lumix range of models. Five cameras have been introduced in total, each slotting into various ranges in the Lumix lineup, and each with slightly differing specifications. Here's a rundown of each of the new cameras, along with their expected UK availability. First up are the 16.1 megapixel FS45 and 14.1 megapixel FS40 models. For the first time, Panasonic has introduced the high quality Leica DC Vario f/2.5 lens to the FS range of cameras. The lens is also a 24mm ultra wide-angle lens. The f/2.5 lens is approximately 25% brighter than f/2.8 lenses, which are commonly found on cameras of this type. Coupled with mega O.I.S found in the iA mode, the cameras claim to suppress the blur caused by subject movement. Equipped with a 5x optical zoom, both cameras also feature iA zoom, which promises to double the zoom length with minimum deterioration of image quality, thanks to Intelligent Resolution technology. The cameras also feature SonicSpeed autofocus for quickly locking onto subjects, while a fast Venus image processing engine is also included. Both cameras feature HD video recording at 720p in either 30p, 25p, MP4 or Motion JPEG (FS40 only) formats. Videos can be directly uploaded to YouTube using the Lumix Image Uploader. iAuto, AF tracking, Intelligent ISO control, Face Detection, Intelligent Scene Selector and Intelligent Exposure are also incorporated into the camera, along with a selection of fun filters such as Miniature mode. The Panasonic Lumix FS40 and FS45 UK prices have yet to be confirmed, but they will both be available in a variety of colours from March 2012. 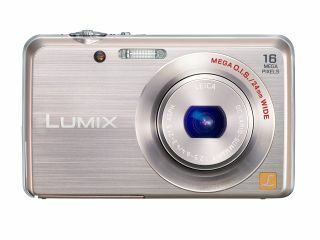 Also announced is the 16.1MP Panasonic Lumix S5, which features a 4x optical zoom lens. The camera is also equipped with Intelligent Zoom to increase the magnification to 8x zoom. Other standard Panasonic compact camera features on the S5 include Mega O.I.S and Intelligent Auto mode. HD video recording at 720p is also available, along with fun filters and the ability to shoot Panoramas. UK pricing and availability for the S5 is yet to be confirmed. Finally, a new duo of high zoom cameras to slot into Panasonic's SZ range also make their debut. The SZ1 and SZ7 both offer a 10x optical zoom lens, coupled with Intelligent Zoom to increase the zoom capability to 20x. The lens, which is a Leica DC Vario Elmar, is 25mm wide-angle (35mm equivalent), and is an ultra-thin lens - the total body width of the camera is just 21mm deep. A 14.1MP MOS sensor can be found on the SZ7, which promises a number of capabilities, including high-sensitivity image recording and Intelligent Noise Reduction. An advanced image processor, Venus Engine, is also included, which enables the camera to shoot at 10fps in 14 megapixel full resolution with mechanical shutter, or 5fps with continuous AF. Full HD video recording is also available. The SZ7 also boasts "light speed" 0.1 second autofocus, designed to quickly lock on to subjects. Meanwhile, the SZ1 employs a 16.1 megapixel sensor, new Venus Engine (VII HD) and Sonic Speed AF and 720p video recording. Other features also found in other Panasonic compact cameras are also included on both the SZ1 and SZ7. These include fun filters, auto retouch and Intelligent Auto mode. UK availability is set for March, but Panasonic SZ1 and SZ7 UK prices are not yet known. We do know, however, that the cameras will be available in a variety of colours.